Fresh Russian Central Bank data shows that Moscow bought some 106 tons of gold since the start of 2018, with total reserves now approaching the 2,000 metric ton mark. News of the buy-up comes after a confirmation by the US Treasury Department that Russia dropped out of the top holders of US bonds. Sputnik explores the move and its possible reasons. According to Russian Central Bank figures, Russia's total gold reserves amounted to 1,944 tons as of June 2018, with the regulator pointing to a steady rise in holdings of the precious metal over the last decade (total gold reserves amounted to less than 500 tons in 2008). In the same period, the share of gold in Russia's total reserves grew from just 2.5 percent to over 17 percent. Last week, the US Treasury confirmed that Russia had undertaken a large-scale dumping of its T-bills, bonds and notes, with holdings falling from $92 billion in December 2017 to just $14.9 billion now, thereby pushing Russia out of the top 33 major holders of US securities. Russia's total international reserves, including gold, now amount to $460 billion, with the Russian Central Bank aiming for $500 billion. US securities and the dollar, the latter serving as the de facto global currency, are currently considered to be among the most dependable high liquidity assets in the world. However, in an era of global economic instability stemming from geopolitical crises and fears of a global trade war, precious metals are seen as instruments providing security and a diversification of risk. With total global unsecured debt hitting some $247 trillion (or 318 percent of global GDP) in June, gold is seen by many economists as a reliable store of value which, while also subject to fluctuations, cannot be drastically depreciated, or suffer an artificial collapse. The same cannot be said of treasuries (American or otherwise), which can collapse in value if a large debt holder were to suddenly dump its holdings. Speaking to Sputnik, Alexander Egorov, a currency strategist at TeleTrade, a Russian broker, outlined the risks associated with US securities. "If for one reason or another a group of states were to present their Treasury holdings to the US for payment, they would simply become worthless. This is a pyramid, because the US, by all appearances, will never repay its debt. This scheme will continue to work so long as it is believed in," Egorov said. And although gold is less liquid than bonds, in the event of a crisis, such as a collapse of the existing global trade order, the precious metal would preserve the function of a means of payment in whatever chaos may ensue. 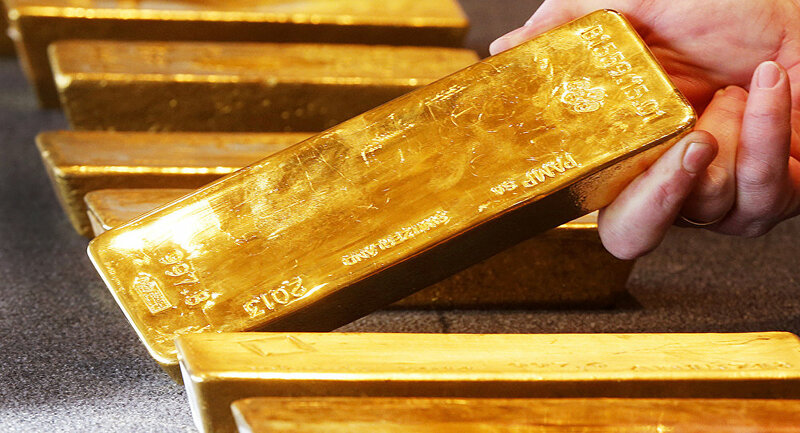 Keith Neumeyer, chairman of the board of First Mining Gold, a Vancouver-based development firm, said that the reason for Moscow's rush to pull out of US T-bills and grow its reserves of gold was obvious. "I'm certain that a global reset will take place when the governments of the world need to rid themselves of debt, and that they will tie everything to the price of gold. That's why countries like Russia and China are accumulating gold – they know what may happen a few years from now," he said. Russia made it into the top five of gold-holding countries in February; if trends established over the past decade continue, Moscow may take third place in the near future. In the medium to long term, the country could return to the Soviet record of 2,800 tons of gold, according to Timur Nigmatullin, an analyst at Otkritie, a Moscow-based brokerage firm. However, Russia cannot rid itself of the dollar entirely, according to the analyst, since 70 percent of world trade is still conducted using the dollar. "Russia trades in oil, which is denominated in dollars. Accordingly, in order to support import/export operations, a large part of reserves should be in the US currency," he said. Recently, Goldman Sachs predicted that the next few years would see a decline in global gold production. Goldcorp, one of the world's largest gold mining companies, echoed this sentiment, suggesting that by 2022, gold production would fall to early 2000s levels. The US Geological Survey believes that if production continues at current levels, global untapped gold reserves will be exhausted by 2034. With these factors in mind, Russia's move to abandon US treasuries and stock up on the precious metal seems like a golden opportunity to secure its economic future.